I don't have a lot of time for exposition, so I'll just get to the meat of my post. Beat purchased the most awesome expedition snow bike ever built, and today I took it for a test ride in Utah's San Rafael Swell. 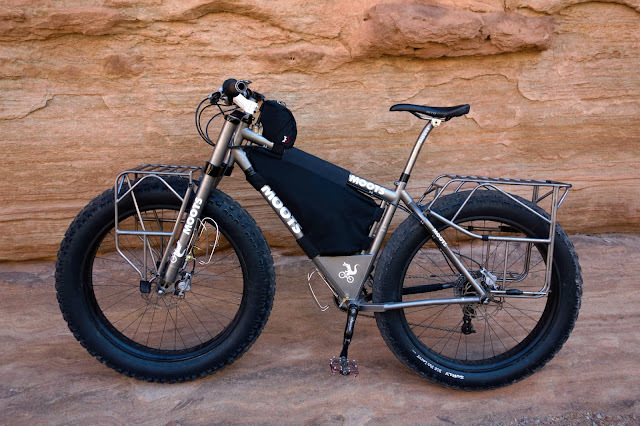 Mike Curiak's purpose-built titanium Moots fat bike, nicknamed Snoots. Proven as a top shelf expedition bike when Mike rode it 1,000 miles completely unsupported to Nome in 2010, carrying 21 days worth of supplies. Why would Mike sell such a beautiful specimen? In his words: "I've owned this bike for a handful of years. 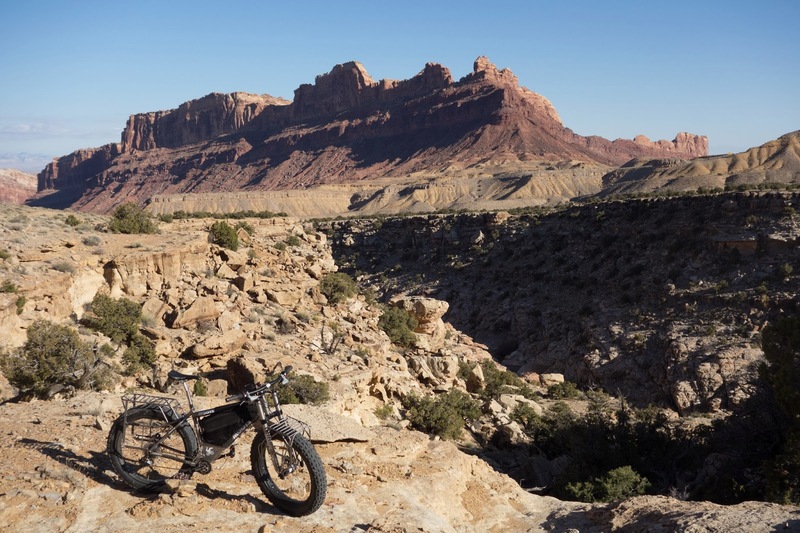 Ridden it across parts of Colorado, Minnesota, Michigan, Wisconsin, Utah, and Arizona. And yes, all the way across Alaska on the Iditarod several times. The original inspiration to build and own this bike was so that I could ride from Ross Island on the Antarctic coastline, following the Overland Traverse all the way up to the South Pole. I spent literal years of my life following this dream — getting the body, bike, mind, and all attendant parts ready. For many, many reasons, I have since decided to move onto other, more engaging projects." Why would Beat purchase such a bike? In his words: "Because I think ahead. It's logical to pick up this bike to me. It works on all levels. I doubt you could get a bike this purpose-built made in the next five years, maybe ever (other than a one-off), and even if we wanted to have one custom-made, it would take us years to learn how it should be made. I think carbon frames will overrun the space with their inherent advantage in design flexibility and ease of production — but with that, expedition readiness can only decrease. Look at how few true innovations have happened in bike tech over the last 20 years — even in the main categories. A few people still fiddle with real innovation (two-wheel drive for example, which I could maybe see some very specific use for, but which is supposedly horribly unreliable) but that's it. And moreover, obviously this is the ONLY actually proven design that exists — because no one's come even close to the unsupported Nome trip." Mike told me he couldn't argue with Beat's logic. Even so, for the past few weeks that Beat and I have been discussing this opportunity, I considered trying to dissuade him. Why would I choose to pass up such a bike? Because while Beat can appreciate the functionality and uniqueness of such a bike, and, ahem, afford it ... the job of actually riding the bike falls squarely on me. Oh sure, Beat will flirt with the notion of a long winter bike expedition. But in the end he will probably always stick to what he knows and loves — foot travel. I'm the one who soothes myself to sleep at night by fantasizing about riding bikes in Greenland and Baffin Island and, yes, across Alaska. 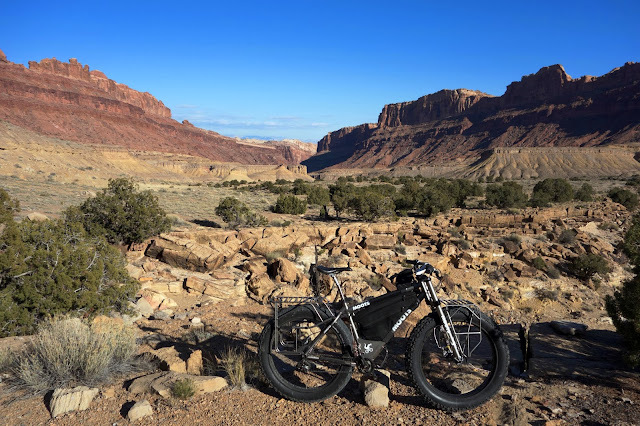 But the prospect actually bringing these dreams to fruition is intimidating and scary, and owning an expedition fat bike can only nudge them closer to reality. Having possession of the Snoots is a great privilege. And you know what they say about privilege and responsibility. I made a meager effort to talk Beat out of making this purchase. "It's way more bike than you and I need," I said. "What already have a fat bike that almost never gets ridden. Because we live in California." "For now," Beat fired back. "But I'm thinking ahead. This bike probably won't still be available when we move to Alaska eventually." Indeed. Possibilities are pretty endless. They could be a year or more down the road, but Snoots will be there when we decide to make those leaps. Mike discouraged shipping this bike, so he and I made a plan to rendezvous in Utah, since I was planning to be here with my car for the 25 Hours of Frog Hollow, and Mike lives relatively close by in Grand Junction, Colorado. We met up in the town of Green River. Mike gave me a quick rundown of the Snoots' special features and set me free with this incredible bike. It was a beautiful day — 55 degrees and sunny, too beautiful not to ride. Just 11 miles west of Green River off I-70 is a narrow vein of the San Rafael Swell called Black Dragon Canyon. I steered clear of the canyon's faint jeep road to test-drive the Snoots in the places where it would shine most — the loose sand and boulders of the wash. 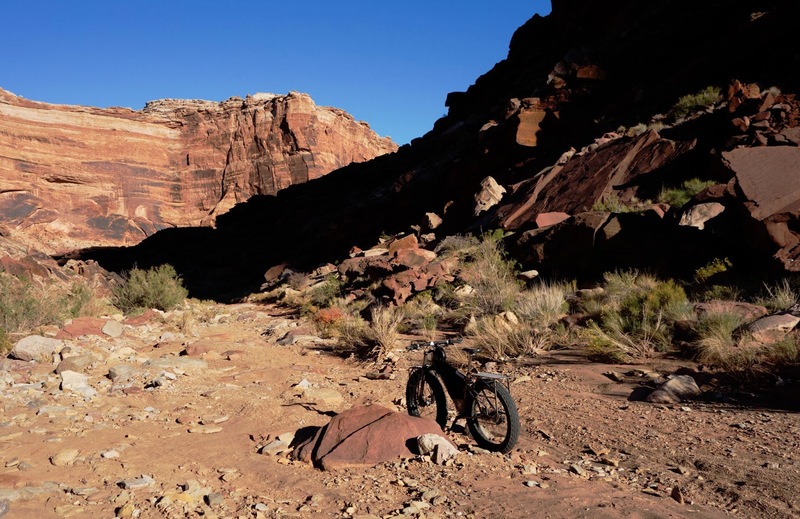 It was enlightening to ride this bike on terrain that it is really good at — sand — as well as terrain that I am not so good at — rocks. I was surprised how responsive this bike is — twisty maneuvers were no problem for the Snoots. Fat bikes have this way of making me feel invincible, and I found myself "sessioning" a few boulders that I normally wouldn't go near. It was no issue to lift the wheel onto ledges. "Note to self; front end looks heavy, isn't that heavy." But then I hit a flash-flood washout, a gorge about six feet deep with no way around, and struggled mightily to lift the bike over my head. The whole bike was sort of heavy. "Note to self: Not a big deal. You have difficulty lifting the carbon roadies over your head, too. Try lifting some weights once in a while." All-in-all, it's actually a super fun desert bike, too. I rode about ten miles up the canyon, until I had climbed 2,000 feet and ended on top of a bench, riding a boring flat jeep road. Normally I love riding jeep roads, but this suddenly smooth and well-drained road just felt beneath the Snoots, somehow. It was time to turn around anyway. I had so much fun with the descent. At one point I launched off a small ledge (also unlike me) and touched down on the slickrock slab below with a dramatic bouncy bounce in both tires, which I had inflated to 10 or 11 psi. "Oops, maybe I shouldn't be riding this bike like this," I thought. But in the next breath, "Nah, Snoots can handle it. Snoots will break me before I break Snoots." Either way, I probably shouldn't be riding an expedition/touring fat bike like a dually with five inches of travel, lest I do break myself. I so love the San Rafael Swell. 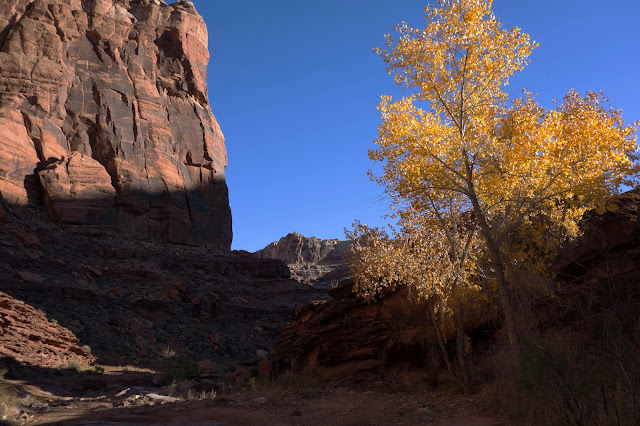 Between the ages of 18 and 19 I transitioned from a teenager who spent every weekend going to movies, seeking out obscure live music shows, and frequenting terrible dance clubs — to a young adult who spent nearly every free weekend camping with friends in the San Rafael Swell. This is the region where I cemented my appreciation of the outdoors and fell in love with the desert. Every time I visit the San Rafael Swell, I'm whisked back to the happiest moments of that time in my life. 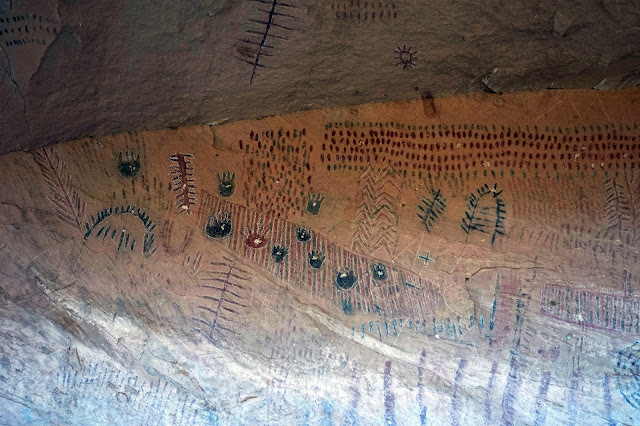 Icing on the cake — the petroglyphs at the mouth of the canyon. I'm super excited about the Snoots, but first thing's first. Headed down to Frog Town on Friday. My friend John bought a Pugsley last year (sort of custom made, he upgraded on most of the components including the gears that have no derailleur, I can't think of the name) He also did a lot of research and found fenders for it, they're made of wood. Not good in the snow though. On a tire from another bike he made it into a studded tire by hand using some kind of screw or something. I told him about your bike and how the fuel is stored in the frame with a spout. He was licking his chops. The "extras" for the Pugsley are so expensive. Glad you had a good time. May the Snoots and ye ride long and prosper. Looking forward to reading about your trek across Alaska on that puppy. Built to travel. You've earned this incredible ride through your own epics. Even if circumstances don't have you on the Iditarod this year, I bet you get a tremendous amount of use out of this bike in the years to come. Congratulations on your new BFF! I never would have thought that something named Snoots would be so beautiful. rightful pairing of this bike with a rider that can put it into appropriate use, and allow the public to live vicariously through the rider's storytelling. Congrats! That looks like a smart buy. And it happens to fit just naturally!? 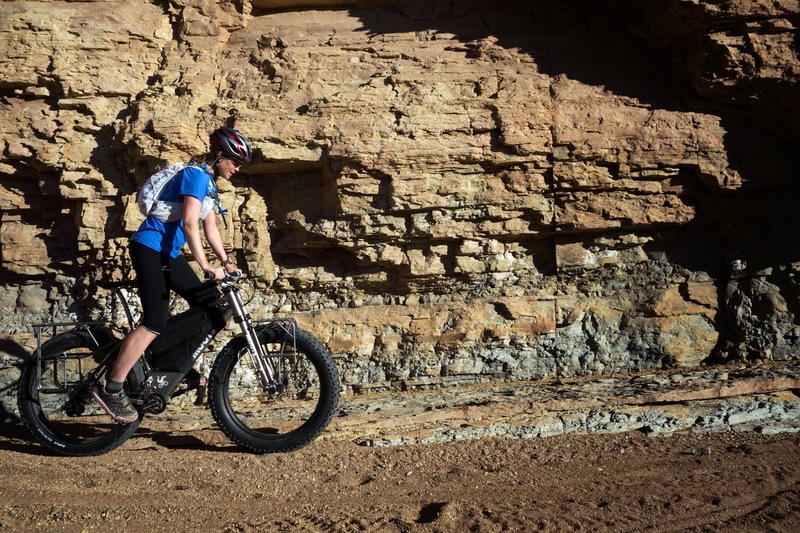 That is the baddest (as in goodest) fatbike EVER! I'm not even a fatbike kind of guy (the places it would excel in have no real interest to me to ride in)...however I'd make an exception for a bike like that. Can't wait to hear what you (and Beat) come up with to test it's (and your) limits! Christams came early in your house!! VERY COOL!!!! And good luck this weekend...be safe and have a BLAST! Here's a list of all the good reasons not to buy another bike. Sounds like your next impulsive move needs to be to a place where you can use that bike a lot! This is great news! So glad that bike stayed in the adventure travel family. Looking forward to some good posts about it! PS. It looks showroom ready...Re-finished and new Decals? Wow! I'm so jealous. I joked w/ my wife about getting Snoots.. So will we see it at the start of Wt Mts?? :) Have a blast with it! I haven't checked in on your blog in a few weeks. I always long for the days it was all about bike adventures. And then this. I knew as soon as I saw the first picture what had happened. I knew Mike had this bike up for sale. I wondered who would purchase such a specialized bike, a bike that is a piece of fatbiking history. No....."snowbiking" history. That's what we used to call it, right? I thought someone would buy it as a conversation piece and it would never again be used for a grand adventure. No pressure Jill, but I think it may be used again as it was meant to be used. 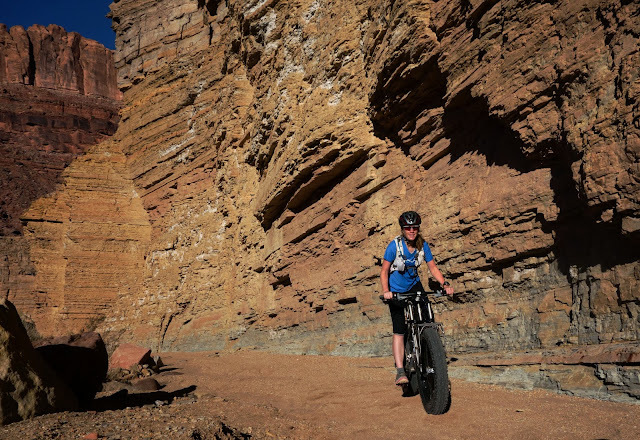 There's hope again that your blog will feature more fatbiking adventure stories. Yeah for you, and yeah for your readers. This is the bike that opened my eyes to the folks at Moots. If I ever replace my Pugsley a Moots Frosti is my first choice of fatbikes to consider. Doug, great to hear from you! I sometimes wonder what you're up to these days. Blogs are strange like that, aren't they? I know my own has shifted focus over the years, I've moved locations and I've changed as well. 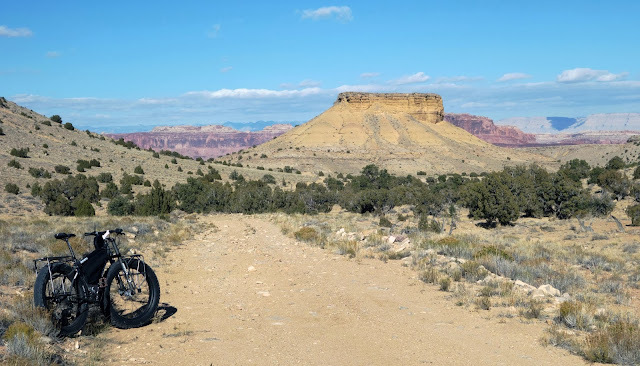 But at the base of all this passing time is someone who still wants to take a bike, pack it with some simple gear, and ride it to incredible places. I hope I can do this bike justice someday, soon.